This is a very happy week for baseball fans the world over—the 2013 major league season officially started on Sunday March 31st, when the Houston Astros beat their in-state rival Texas Rangers 8-2. OK, calm down. This isn’t turning into a sports blog. 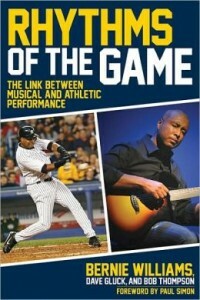 But there’s a longtime love affair between music and baseball that bears revisiting. I shared a few of my favorite baseball songs in honor of the 2012 World Series last fall, but that was just the tip of the iceberg. I wish I’d thought to ask Sam if he’s ever had a chance to talk with former New York Yankee Bernie Williams about the book he wrote on the connection between music and sports. Williams knows of what he speaks. Now 44 and retired since 2006, he hit .297 over 16 seasons with the Yankees, won four World Series titles, played in five All-Star Games and won four Gold Glove Awards. On the music side, Bernie Williams has also released two albums, receiving a Latin Grammy nomination in the instrumental category for 2009’s “Moving Forward. “La Salsa En Mi” gives you a pretty good idea of what his original music is all about. There’s no denying Bernie Williams is taking his second career very seriously. Album number 3 is in the works, and Williams was spotted here in Washington recently. He came to town with other musicians to ask lawmakers to set aside more money for music education in public schools. Roots and Branches for the week of April 9th is devoted to baseball and features songs by Bob Dylan, Chuck Brodsky, Sam Baker and San Francisco Giants 3rd base coach Tim Flannery, just to name four. thanks so much—don’t think my boss would approve, but I’d love it! Don’t know how I managed to stumble upon this but enjoyed it. Sam Bush Band reminded me of an Irish band and how the whole audience over there will sing along…guitar extraordinaire …and then all those names. Cool. Glad you liked it! Sam is quite a talent and a nice guy, too. Please stumble back our way again! Katherine I know its late in the game and you’ve moved on to other things but I hd to thank you for this blog. My 12 year old daughter and I have enjoyed it time and time again. Well done, thanks! Thanks so much! Can’t wait for the start of the next season and more baseball songs!